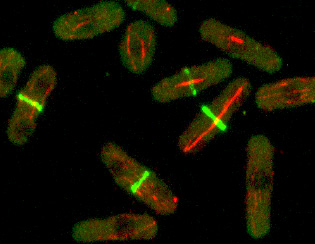 Understanding the mechanisms controlling the cell division cycle is an important landmark in modern biology. In higher eukaryotic organisms, cell cycle regulation is a basic event in development where multicellular organisms are generated by controlled cell division and differentiation, and in understanding oncogenesis (abnormal cell divisions). Within this topic, our end focus on the characterization of new cell cycle control genes identified by our group using yeast as a model organism. In particular, we study new mechanisms coordinating entry into mitosis and other cellular events such as cell growth and cytokinesis. In addition, we also use the nematode C. elegans to assay the role of the identified genes in processes such as development and aging.